This is a great scenic ride down the coast of Baja and then into the mountains. The ride is best done in 3 days and this allows you to spend a relaxed day at the top of the mountains where you can see the Pacific Ocean and the Sea of Cortez. The ride can be done in two days if you want to rush and just ride. This is one of the classic rides with great windy roads. The ride starts at the Tijuana and San Diego border and returns through Tecate. 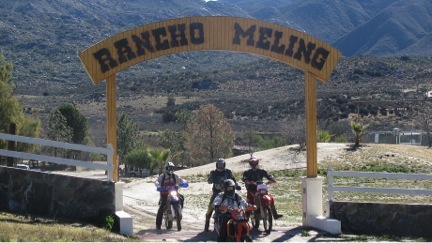 Day 1 Riders stay at Rancho El Coyote Meling. Day 2 It's recommended that you take a relaxed day and travel to the National Astronomical Observatory. Also that day, you might want to enjoy a little ranch life. The following day you have some dirt road options for your travel home. This is a great way to decide if you want to spend more time in Baja.